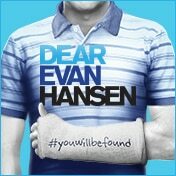 Digital Lottery: On the day of the performance patrons are invited to enter the Dear Evan Hansen Lottery by 9am for matinees and 2pm for evening performances. Winners may purchase up to 2 tickets at $42 each. Lottery tickets may be located in the orchestra, mezzanine, standing room, or boxes of the theater and may have a partial view of the stage. Winners may not be able to purchase a pair of tickets located next to each other.